It is important to note that the animal shown in this series of photos was taken from a trap. Animals in the wild do not split up the back like this, rather the cephelothorax and tail seperate on the dorsal aspect and the animal backs out through the resulting opening. Why animals in traps shed in the manner depicted here is a mystery. One theory is that the lack of natural substrate deprives them of edges to use to leverage the shell off. Another, more interesting theory is that the animal tries to postpone molting in the trap because molting would leave it vulnerable to attack by other inhabitants in the trap. This may sound far fetched until you learn about the role of environment and chemical signals involved in molting and mating (two activities that are usually linked) and why being stuck in a trap is probably not percieved by the animal as the right place to conduct either of these activities. At any rate, eventually the proccess can be postponed no longer and the shell splits, due either to changes in fluid concentrations in the tissues, or perhaps to a growth spurt that splits the shell like a pair of jeans that have become too tight. No one seems to know for sure. 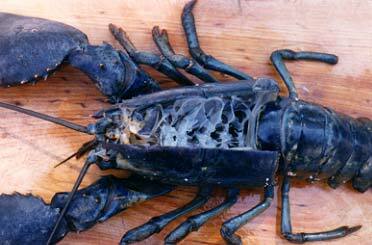 This lobster is ready to start a molt. Notice the fine, straight crack opening along its back from the head to the end of the carapace. This is the same animal several hours later. The crack has noticeably widened. By the end of the day, it had not progressed much more than this. By the next morning, it had completely escaped its old shell. The result was a surprisingly soft, rubber-like animal. 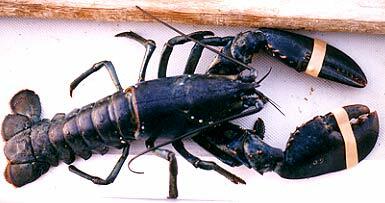 The claws and legs are limp and the new shell seems no thicker than waxpaper. At this point the animal is extremely fragile...and quite exhausted. This is what remains of the old shell. Notice that the antennae have also shed their coverings and although not clearly visible here, even the eyes have shed a layer. There are no other breaks in the shell except the one visible along the back. The animal has withdrawn its claws and legs as if slipping out of overalls. The animal then flips its tail until the it is free of the old shell. A closer view of the inside of the old shell. What appear to be cobwebs inside is actually fine structures that are part of the shell. 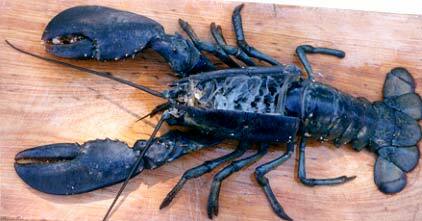 The empty claws are surprisingly heavy. 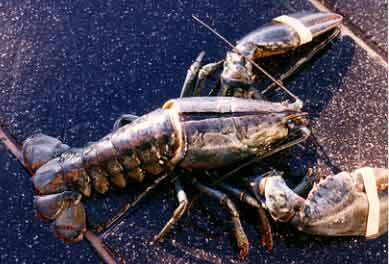 To learn more about the molting process, visit The Lobster Conservancy's page on lobster physiology.